In an interview with TechCrunch Skylights VR is soon hoping to offer virtual reality in-flight entertainment, and says it could be a differentiating point between airlines attracting those that would like to engage in little VR entertainment from other airlines that don’t offer the VR service. The Skylights VR headset will be equipped with 40 HD films and will provide an immersive entertainment experience allowing users to feel like they are sitting in a cinema. Although there are a few limitations to the headsets which include the current charge some of the batteries which providers six hours of use. 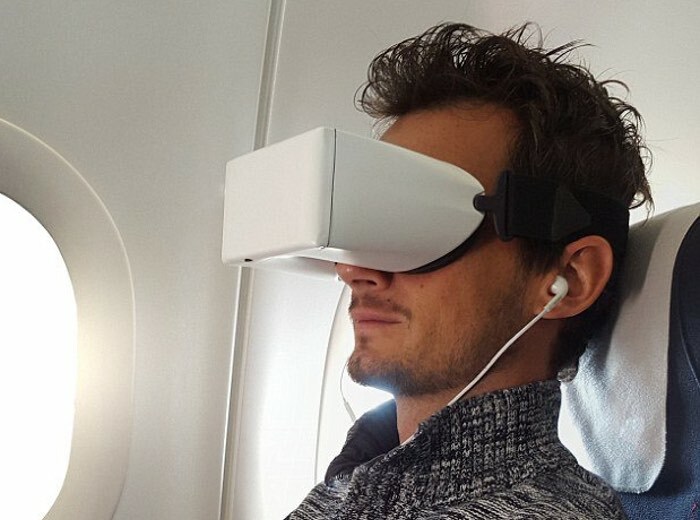 However using a virtual reality headset for the full length of the flight may cause additional issues such as sickness, but these have yet to be experienced. VR Zone explains more about the new VR in-flight entertainment experience. Skylights also offers extensive support for its headset towards airlines. Their website offers ground-up logistics to help with the installation and issues such as charging and conditioning. It also offers help with potential upgrades and and maintenance for airlines. Most importantly, the chance to offer 3D movies could be a major selling point for the headset for Airlines, especially those who pride themselves on the quality of their inflight entertainment. For more information on the new Skylights VR jump over to the tech websites for details by following the link below.